A racing Yatch of the finest pedigree. 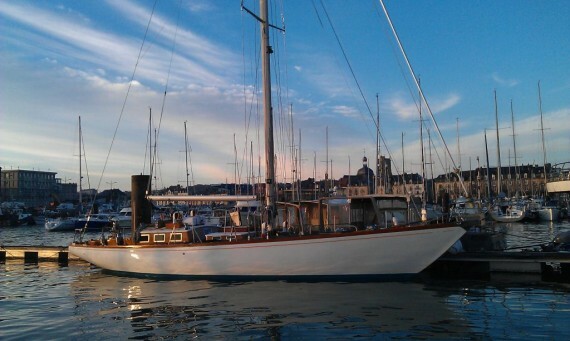 Originally commissioned under the name of Chrismur II she was designed as a 37′ LWL racing yatch under the Rorc rating. Her original purpose was to represent France in the 1969 admiral cup. During his time at S&S, German Frers himself drafted most of the lines and with such an illustrious heritage, this design sits at a crossroad between classic yachting and modern racing. The skeg rudder was a relatively new feature at the time, the deep V shape of the hull still gives her the beautiful sea keeping ability of a bygone era. She has competed in quite a few fastnet races when she was used as a training vessel under her third owner. Who renamed her St. Christopher. She recently underwent an extensive refit at chantier naval du Cap Fagnet.